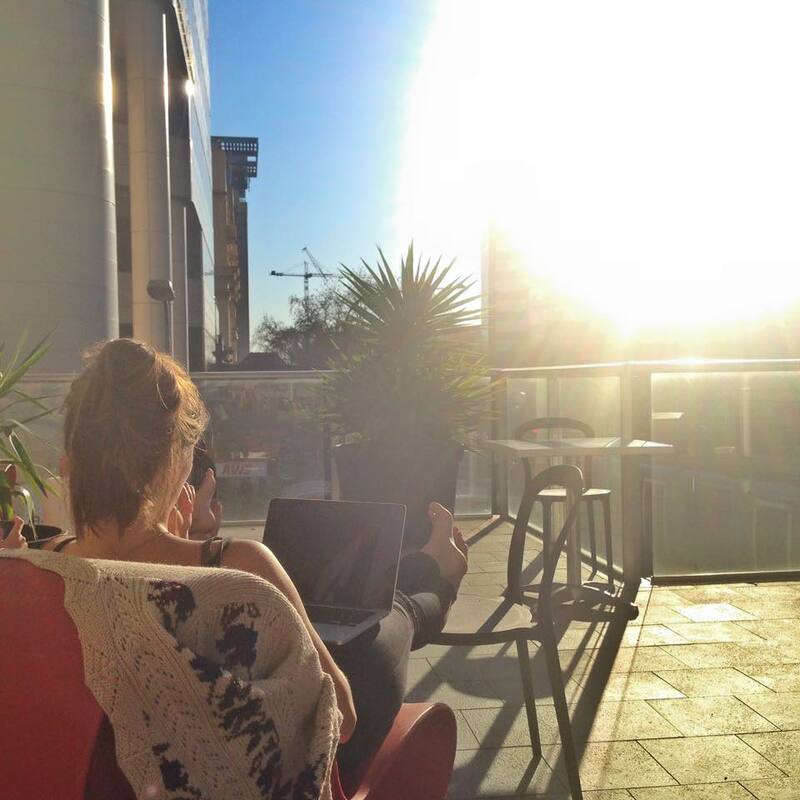 The week started off beautifully resulting in us all heading home from uni in the afternoon to do work on the balcony whilst catching some rays. On Tuesday there was a big fire in the CBD which turned out to be just on the corner from our accommodation. It was a pretty big blaze across multiple buildings drawing out over 80 firefighters and took a fair few hours to get under control but thankfully there were no fatalities. After staying clear of the chaos working on campus till late most of the smoke had cleared and in the evening we headed for the nike+ running club which was well needed after a long day at uni. This week we went for the 5.30/km pace group for 5km but it ended up being 5.20/km and 6km so it was no wonder we all finished quite tired!! This evening they were offering free nike tops if you uploaded a picture of the evening with the #werunadelaide. After marvelling over these tops that you have to run 8 weeks consecutively for to win we were amazed they were giving left over ones away so we were all straight onto Instagram and won our tops (retail price $40). 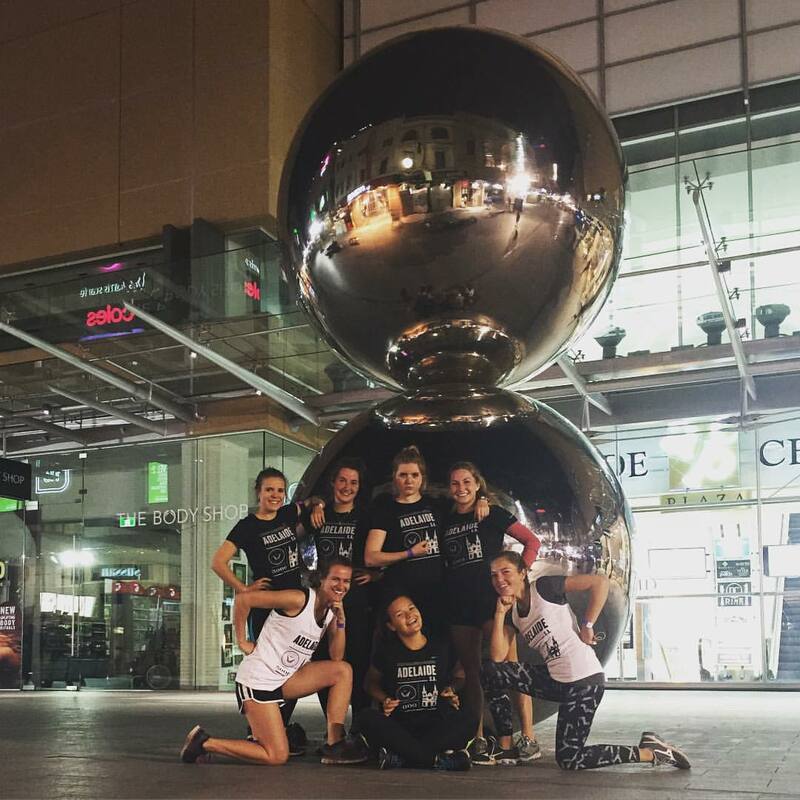 Being as chuffed as we were we had to take an obligatory photo with our new tops on by the Rundle mall balls. The rest of the week was fun filled with work due to upcoming deadlines at the end of the week and lots more to come before I head to the East Coast!! Long campus days were perked up with our fortnightly union members free lunch on Wednesday which was a cute little packed lunch and on Friday, well lets just say it was a good day. In the morning the international office were hosting a free pancake breakfast on campus to celebrate the launch of their Health and Relationships website. Other stalls were also there including free popcorn! Then the rest of the day was spent in the library sat on the edge of our seats awaiting Ben & Jerry’s to post their secret location of their ice-cream giveaway Facebook event! They posted around midday that they were on Rundle mall just a 5 minute walk from campus so we all headed straight there, everyone in the library seemed to be doing exactly the same thing. 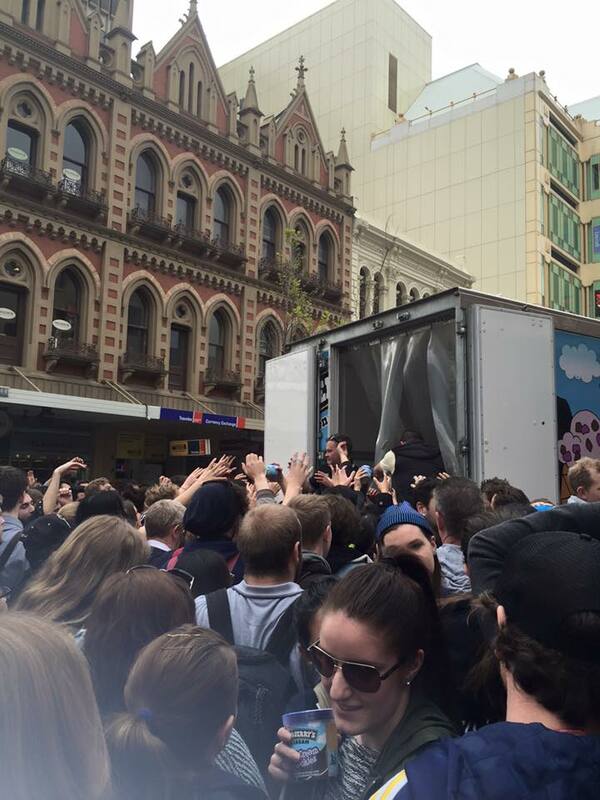 The Ben & Jerry’s van was surrounded by people (mostly students of course) and they were handing out large tubs unlimited. People were walking away with multiple tubs and even crates, it was literally crazy (even the police came to supervise). I walked away with Chubby Hubby and Sweet Cream and Cookies tubs (two of my favs so I was grinning and needless to say they have been devoured). In the evening a group of us headed out and tried a new bar out which was good fun but of course the night ended in the legendary London (so awful its great). 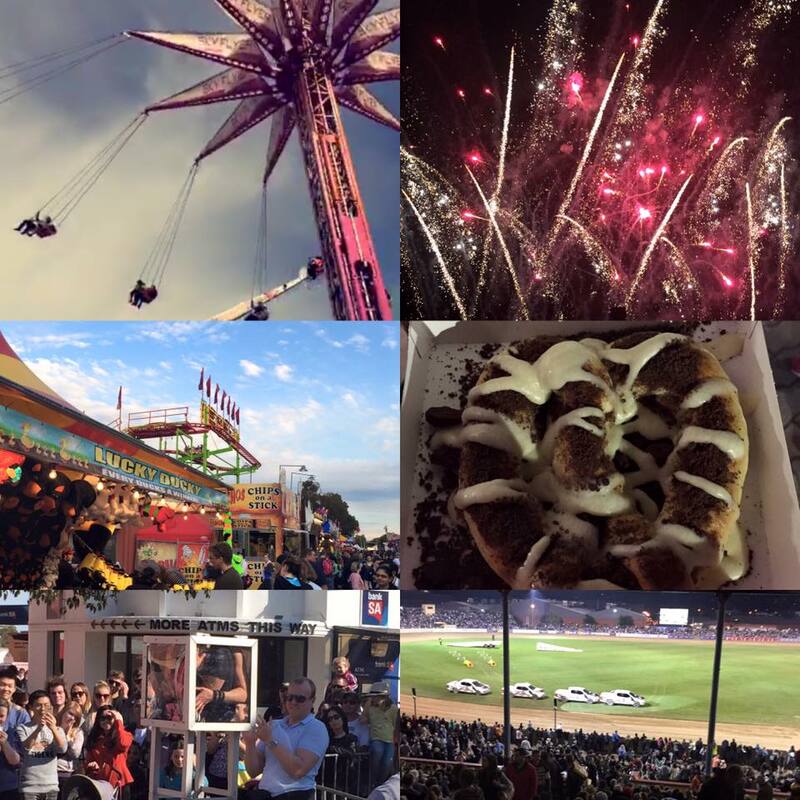 I was very excited to be attending the Royal Adelaide Showgrounds in Wayville on Saturday for the Royal Adelaide Show!! I was lucky enough to have won a VIP ticket to the show through a competition with study adelaide so I gathered a group of friends together and we all headed out extremely excited for the day ahead. 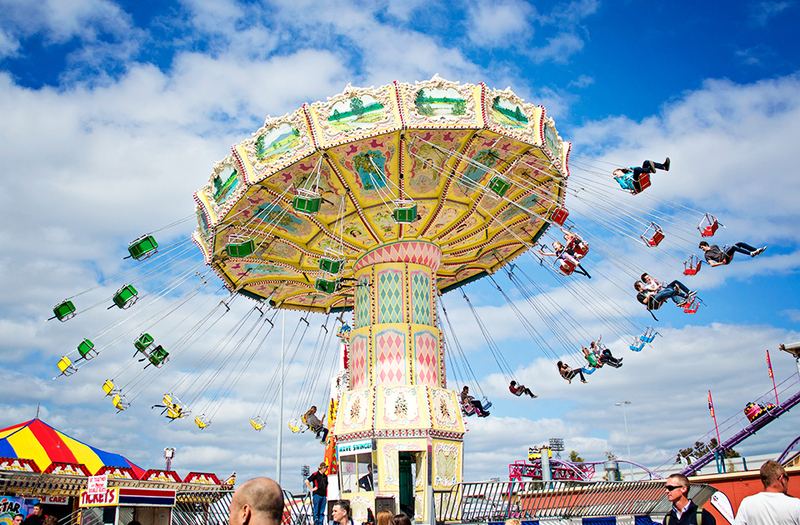 The annual agricultural show and fair runs for ten days attracting almost half of the population of the entire state and even visitors from other states and overseas marking it the second biggest event in Australia. The Royal Show displays the states greatest Agriculture and Horticulture with the freshest fruit and vegetables. The show grounds were huge and there was so so much to do such as: fair ground rides, ferris wheel, horse dressage, sheep shearing, cow milking, performances, dog shows as well as a dog choir and competitions in such things as food produce, art and floristry (there was even an Olaf from Frozen). Yet there was so much more!! One of the craziest performances we saw was watching ‘bendy em‘ a body contortionist fit herself into a 16 x 16 inch glass box, pretty freaky! 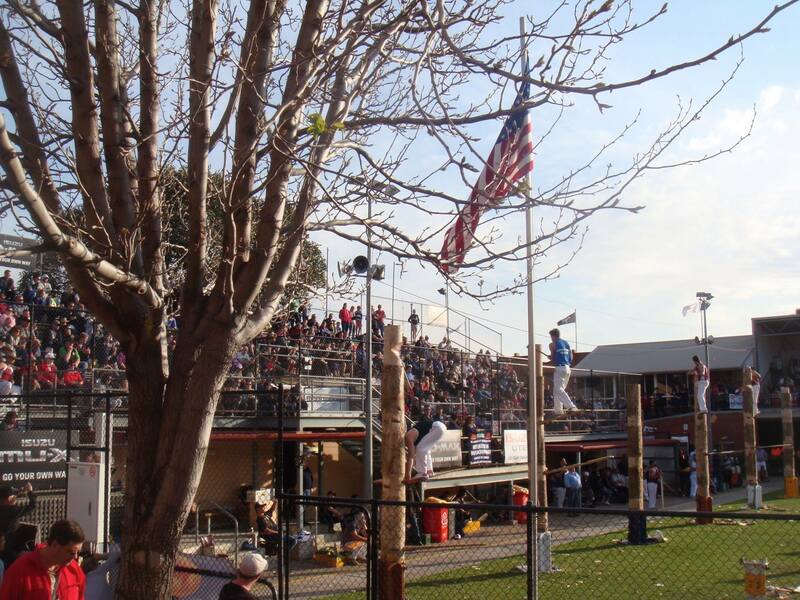 The woodcutting carnival was one of my highlights of the day. It was fascinating to watch and was my first time seeing anything like it so it was a great experience. One of the rounds ‘the Bone Timber-Tree Felling’ took us by surprise. They had to make their way up to the top of their tree by making crevasses for their spring boards for them to climb onto to make the next crevasse to ultimately get up to the top of either side to axe the top softer section of the tree off. We even got to watch the sixteen time world champion tree feller Matthew Gurr from Tasmania in all his glory axing through his tree in a matter of seconds (he even had a 115 second handicap). The animal tents were full of cats, dogs, rabbits and much more being judged in competitions. There were shows of the animals to watch and you could even hold some of the animals (of course I chose the labrador puppies over the snakes). Another notable aspect of the show is the Showbags which are bags containing products sold as promotions for buisnesses ranging from $1 to $40, some people didn’t have enough hands for their bags! Enjoying my eye massage, I nearly fell asleep! Hundreds of local businesses had stalls displaying their produce and offering discounts, we enjoyed all the free food tasters from shortbread to chutneys. 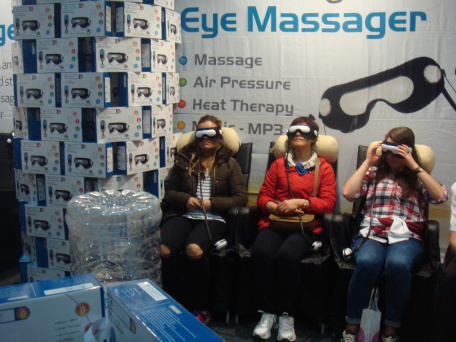 A few of us even enjoyed an ‘eye massage’ by a new product, its quite a look don’t you think? Alongside my VIP ticket which enabled me to enter the members facilities (members stand etc) I was given a meal voucher so I indulged into typical fair food choosing from options of everything under the sun. The go to show food seemed to be corn, sausage on a stick, donuts and chips on a stick (potato sliced and swirled around a stick deep fried and seasoned). I went for a cookies and cream sweet pretzel during the evening show and it was heaven in a box! The evening show was full of amazing performances in the main arena. These included: farms skills race, Rooftop Express, Monster Truck-The Devil’s Taxi, Dog High Jump Spectacular, V8 Ute Challenge, ShowTime Freestyle Motor X team and the Isuzu Team D-MAX. The acts were amazing to watch and included some crazy stunts such as the Isuzu Team-D-MAX doing dangerous cross overs, looping the track on just two wheels and riding in close formations with two cars facing forwards and the other two backwards. Then the show was rounded off with an incredible fire work display put on by farmers union iced coffee (famous iced coffee in South Australia). After a long day out at the show (10 hours!!) we all were looking forward to crawling into bed. It was such an amazing day getting to see more of the culture of Australia and experiencing the famous show, it definitely exceeded my expectations! This year the show runs from the 4th-13th September so I would definitely recommend a trip to the show, you will not be disappointed! Sunday morning we all rolled out of bed in our pjs at 9am for it was free pancake morning on the balcony!! I ended up cooking all the pancakes for everyone which was fun and people seemed to love them (plus it meant I could accidentally make a big one that had my name written all over it). Fuelled up on sugar I worked all day into the late evening doing assignments and revising for my mid-semester test I have on Tuesday. Ive got a busy upcoming week with my exam and a deadline list as long as my arm but it will be all worth it with the East Coast trip in just 10 days and I am unbelievably excited. Ive also got some little bits planned throughout the week and the colour run on Sunday to look forward too!